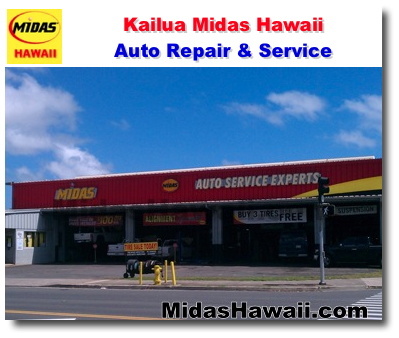 Midas Hawaii- Auto Repair - Brakes, Oil Change, Tires, Lube, Maintenance, Air Conditioning, Complete Auto Repair, We do it all! 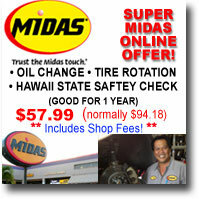 Midas Oil Change Plus, Tire Rotation, Safety Check Combo Certificate $53.29! With over 50 years of experience, Midas has the expertise to keep your car ready for the road ahead. Did you know that the best way to reduce automotive repair costs is to maintain your vehicle properly? Midas also does Hawaii State Safety Inspections. If your car needs parts, Midas service technicians use those with high quality materials which have undergone tests for durability, reliability and performance. The single most important piece of maintenance you can perform on your vehicle is to change its oil as recommended by the manufacturer, based on your driving conditions. Midas technicians know every part of your brake system inside and out. Our full line of brakes and brake repair services is the reason we're Hawaii's brake service leader. At Midas, we're committed to the safety and reliability of your vehicle. In fact, our mechanics are trained to perform factory-recommended maintenance services for most vehicles. Midas provides expert tire service and sales with genuine Sumitomo® tires. Our technicians will inspect, rotate, and balance your tires, as scheduled. Think you have steering or suspension problems? Your local Midas shop has the know-how to diagnose and repair any problem. Midas takes pride in providing high-quality mufflers, pipes, and other exhaust components, including catalytic converters that meet stringent EPA and CARB requirements for pollution reduction. Midas trained professionals can test your car battery, replace it if necessary, and provide you the comfort that comes with knowing your car will start when you need it to. Midas Suspension specialists are fully qualified in the latest Suspension diagnostics and technology. They will inspect your entire suspension system, including rack and pinion steering gear, struts and CV joints. Midas' expert auto repair technicians are equipped to deal with heating, air conditioning, and defroster problems and are specially trained to repair today's automotive air conditioning and climate control systems. SUPER PACKAGE DEAL - Save $$$ - Buy Online - Each certificate is good for a Midas Oil Change including up to 5 quarts of 5W30 Oil and a new Oil Filter, a tire rotation and visual brake inspection. Now you can surf the web, work, etc. as you wait for your car. Bring your laptop, iPad, cell phone and stay connected! Schedule your auto repairs online with Midas Hawaii. 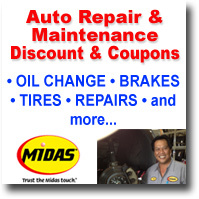 Midas Oil Change Plus, Tire Rotation, Safety Check Combo Certificate $57.99! Midas has been in Hawaii for more than 40 years. We're your one stop auto maintenance and auto repair shop. Get Midas Hawaii coupons and discounts on trusted Midas services. Oil changes, auto repair, tire repair, brakes and more. We care what you think. Let us know so we can continue to be the best auto service and repair shop for you. 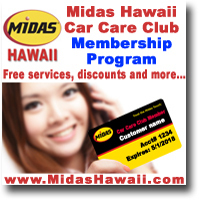 Midas Hawaii Car Care Club program is our exclusive annual membership program. This program is a great way for customers to save money, get free services, get priority support, special offers, a membership card and more. View the latest news from Midas Hawaii. New auto repair services/ products, newsletters, new oil change coupons and discounts and much more. 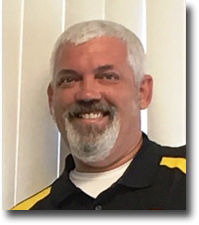 Great auto tips, resources and education. Auto maintenance tips, auto tips, auto safety tips, auto repair and service tips and more Become and educated auto owner! Find a Hawaii Midas shop near you. View Interactive map and all Hawaii locations. We're your one stop auto maintenance and auto repair shop. Midas. With over 50 years of experience we have the expertise to help keep you and your loved ones safe on the road. Copyright© 2003 - 2019 Midas Hawaii. All rights reserved.